With Drought Emergency Over, Californians Debate Lifting Water Restrictions California is expected to begin easing sweeping water use and drought restrictions after an extraordinary winter of storms. But a fierce debate rages over whether the rules should become permanent. Winter rains have eased the drought in the Santa Monica Mountains National Recreation Area northwest of Los Angeles. As California water officials confirmed Thursday that the snowpack in the Sierra Nevada remains well above average, pressure was mounting on the state to lift emergency water restrictions that have been in place for two years. The snowpack across the mountains is now 164 percent of average, a closely watched marker in the nation's most populous state — and biggest economy — where one-third of all the drinking water comes from snow-fed reservoirs. Two years ago, Gov. Jerry Brown stood in a barren, snow-less meadow near Lake Tahoe and ordered a mandatory 25 percent cut in urban water use. State regulators also followed with a series of tough conservation and enforcement measures against water wasters. Most users in the state met — and in some cases exceeded — the targets, and today, according to the federal government's drought monitor, only about 8 percent of California remains in severe drought. "This is not an emergency," says Rob Hunter, general manager of the Municipal Water District of Orange County, which secures water for more than 2 million people in the suburbs. Hunter says his agency is losing credibility with customers who are being told to keep cutting back even when the reservoirs are full and the Sierra Nevada is blanketed in white. "We're still in a drought," Hunter says. "To be truthful, Southern California is almost always in some form of drought, but it's not an emergency." Earlier this year, Hunter's agency passed a resolution that declared the drought emergency over, and have since been calling on the state to do the same. Hunter says his county is using on average 20 percent less water than it did at the start of the drought. Overall, water consumption mirrors the rates of the 1980s, even though Orange County has added a million people. Gov. Brown indicated recently that the emergency order may get rescinded as early as next month. But nothing is final. "You can't stay at Defcon 1 forever, but you can figure out how to maintain that sort of sensible vigilance," says Felicia Marcus, chairperson of the California Water Resources Control Board. Marcus, whose board enforces the drought restrictions, wants to see some of them made permanent, like the requirement that utilities publicly report their conservation targets monthly and the tougher penalties against water wasters. The debate over whether the restrictions should stay or go is leading to some soul-searching among Californians, especially amid predictions that with climate change, droughts could be more severe and prolonged. 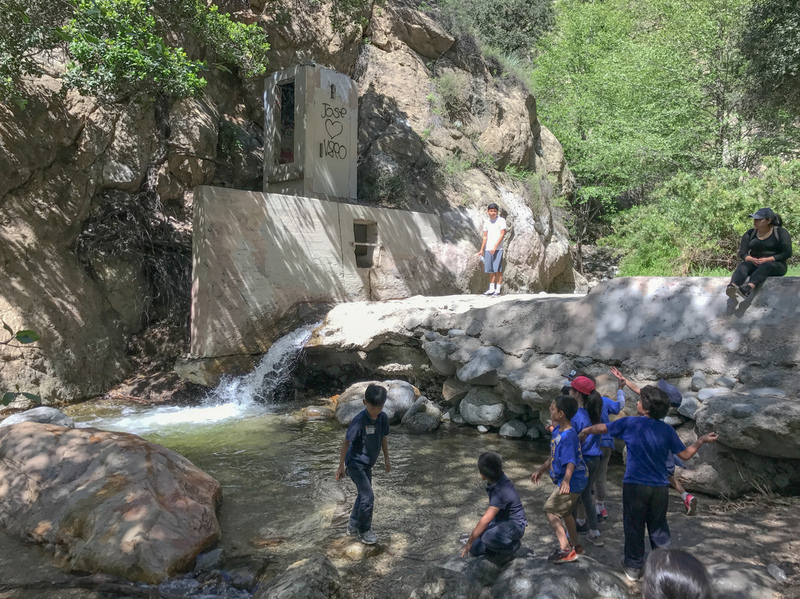 School kids enjoy the water in Eaton Canyon near Altadena, Calif.
"I don't think they should lift it," said Nicole Garcia, while hiking with her dog this week near Pasadena. 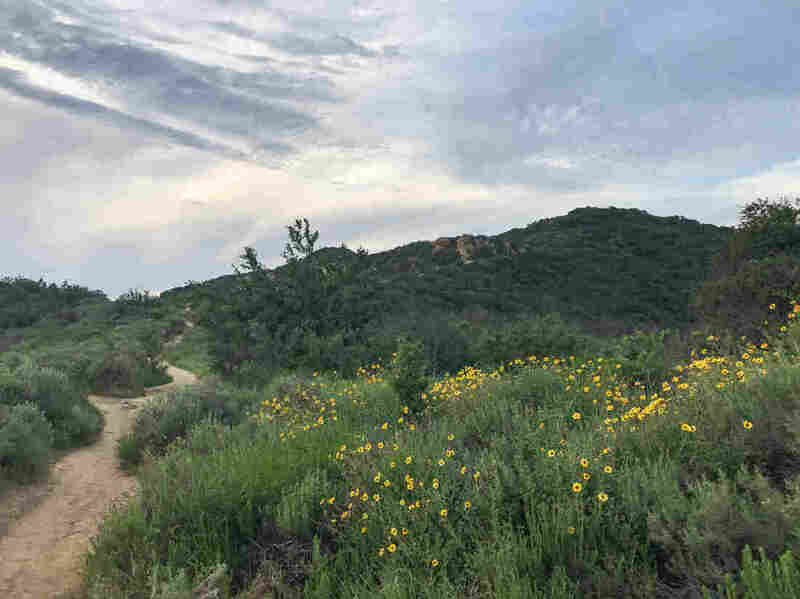 Los Angeles County boasts a maze of open space trails that offer a respite from the grit and smog of L.A.
Garcia marveled at how green and lush the mountains were. Nearby, a creek was running for the first time in years, as was a waterfall farther up Eaton Canyon. Still, she worried that lifting the order could cause complacency. "Californians aren't that respectful of water," Garcia says. "They kind of waste a lot of it." That's a common stereotype in Southern California particularly, where imported water has long been used to make the arid land look more tropical in places. During the latest drought, xeriscape lawns replaced green turf, and, more generally, water use was slashed by more than 30 percent in some cities at the height of the crisis. Gene Schugg, a hiker from Orange County, said the restrictions were good because they made people care about the crisis. "But it is time to lift; we do have a lot," Schugg says. "But what about our water rates; will they come back down?" That's one thing that no one is counting on, in an arid region where drought always looms right around the corner and the population keeps rising.